I tend to get pretty conservative when it comes to preparing fish. I have two favorite recipes, Asian Infused Sea Bass and Puff Pastry-Wrapped Salmon, which fly off the table the moment I serve them to my family and I so make them often. Craving something lighter and fresh-tasting, I decided to mix things up and prepare a Fish Taco recipe from Williams-Sonoma’s book, Comfort Food, Warm and Homey, Rich and Hearty. My palette instantly came alive when I took my first byte! Sweet and zesty salsa paired with mild snapper, and wrapped in a crispy tortilla, really worked well and was a perfect choice for dinner on a hot summer night. To make the salsa, peel, pit, and dice the mango. 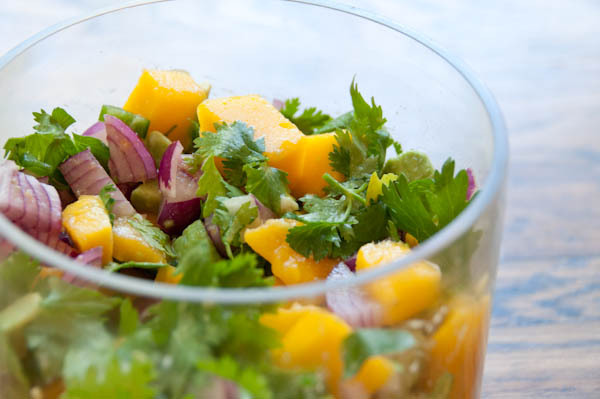 In a small bowl, stir together the diced mango, onion, cilantro, chile, lime juice, and salt. Cover the salsa and let stand while preparing the snapper. Prepare a grill for direct-heat cooking over medium heat. Meanwhile, in a shallow ceramic or glass bowl, whisk together the lime zest and juice, olive oil, cilantro, chili powder, and galric. Add the snapper and turn to coat. Let stand while the grill is heating, no longer than 30 minutes. Lightly oil the cooking grate. Remove the snapper from the marinate, season it with salt, and place on the grill. (You can use a perforated grill grid if you have one.) Cover and cook until opaque when flaked in the thickest part, about 5 minutes. (No need to turn the snapper.) Transfer to a cutting board. Do not worry if the snapper prices fall apart when you remove them from the grill. Tent with aluminum foil to keep warm and let stand for 3 minutes. Meanwhile, place the tortillas on the grill and cook, turning once, until heated through, about 1 minute total. Wrap in a cloth napkin or kitchen towel to keep warm. Flake the fish into bite-sized pieces and transfer to a serving plate. Serve at once with the salsa and tortillas, allowing diners to fill their own tacos. Like the blog. Nice photos. It says there you’ve known your husband since high-school. What is the statute of limitations in California? Fresh and light! Great recipe!